WAPPINGERS FALLS, N.Y. -- Alex Holderbach lined the most clutch hit of his young professional career Sunday, and only moments later, found himself restless in the dugout. The bases were loaded again, but this time, he could only watch. "I was sitting over there, bottom of the inning just pacing because I was so excited and I know everyone else was doing the same thing," he said. "But it's a great feeling." Nerves turned to joy when the Astros prospect and the ValleyCats swarmed Jacob Billingsley on the mound for a champagne celebration. Holderbach hit a two-run single in the 12th inning and Billingsley escaped a bases-loaded jam in the bottom of the frame for the game's final out as Class A Short Season Tri-City held off Hudson Valley, 4-2, to sweep to the best-of-3 New York-Penn League championship at Dutchess Stadium. "I don't even know how to describe it, honestly," Holderbach said. "We've all worked so hard toward this goal and being able to do that in the end on the field is a great feeling. It's a very special moment." Houston's 16th-round pick out of Eastern Kentucky earlier this summer slapped a single to center field that plated Oscar Campos and Logan Mattis with two outs in the 12th. The defending league champions didn't go down without a fight in the bottom of the frame, loading the bases with two outs on three walks by reliever Manny Ramirez before ValleyCats manager Jason Bell called on Billingsley to get the final out. "I felt confident in him, he was the guy on the mound when we clinched in the regular season," Bell said. "I knew he would compete and I knew he was tough. I figured he was gonna give us everything he had." The 24-year-old out of Mississippi State fired three pitches before being mobbed by his leaping teammates. Billingsley, who had one save in nine appearances this season, got Jacson McGowan to fly out to center field to set off the celebration on the infield that ended with champagne and one large trophy. "He came in and located three sliders with the bases loaded and the tying run on second base and that speaks wonders about who he is and where he's come from and who he is as a person," Bell said. "That was fun. Man, that was fun," Billingsley said. "It means everything to a lot of these guys. It was a big situation and a big game. The City of Troy has been phenomenal to us. So it was fun to be the guy to get the last out." Billingsley said he wasn't nervous being thrown into what some in the relief business might consider a nightmare scenario. "You've been in that situation so many times when you've gotta come out of a jam. It's kind of one of those things when you don't have time to have nerves," Billingsley said. "I didn't really think too much about it. Didn't have the chance to. You're in the game, it was fun and I'm glad it worked out in our favor." "It's awesome to win," Holderbach added. "I don't think there's a word to describe how you feel." Holderbach was 0-for-4 entering his final at-bat, but Bell said he hadn't lost any confidence in his infielder. "Definitely one of the biggest hits in my career," Holderbach said. "I've got to give it to the guys who got on ahead of me. Our pitchers locked it down for us. Our pitchers were lights-out. I just got the hit, but it's a team game and we grinded through it." The win capped Bell first season as a manager. He served as a development coach with Class A Quad Cities last year when the River Bandits won the Midwest League title. "It's more about them. They believed in me since the first day when there really was no reason to believe in me," Bell said. "Hats off to the players and our coaching staff. That was a crazy game and it feels amazing to be the champion." The team was ready to cut loose on the mound at The Dutch, with players shaking their green bottles while they waited for their skipper to join the crowd. Finally, the celebration was on. "There's no better shower than a champagne shower," Bell said. "That's the way I see it. It doesn't maybe make you the cleanest, but it's really special. You just never know how often you'll get to do them. I've been very fortunate to be able to that this year and also last year. Memories you'll never forget for the rest of your life. ... I couldn't be more proud of them." Holderbach batted .201 with three homers and 23 RBIs in 42 games this season after signing on June 14. Bell said he was impressed with the infielder's performance. "It says a lot about his character. That's not an easy thing to do," Bell said. "He had some tough, pressured at-bats earlier in the game. He saw the first pitch well, didn't get the pitch that we wanted and the second pitch he executed the base hit that scored two." 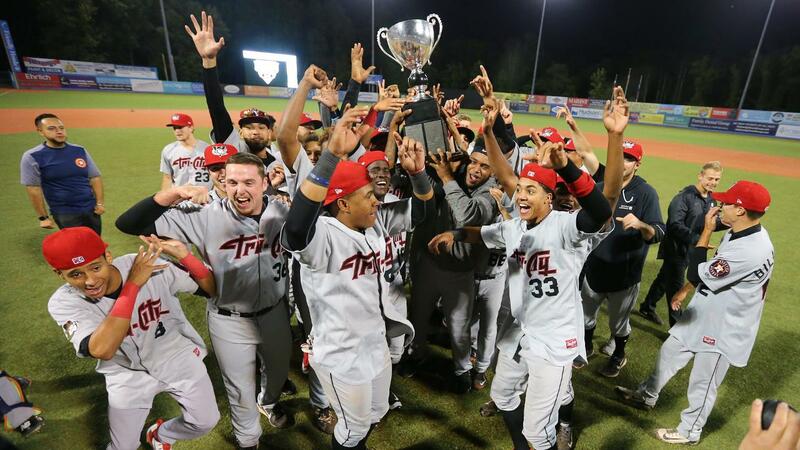 Tri-City's last championship came in 2013. The ValleyCats reached the Finals for the first time since 2014 after going 42-33 to win the Stedler Division. Hudson Valley, which claimed the crown last season, sought its third championship since 2012 after going 45-30 to win the McNamara Division. The Renegades outscored Auburn, 18-8, in a two-game sweep to advance to the Finals while Tri-CIty took care of Mahoning Valley in two games in the semifinals.